As the time is ticking and counting down to the new year, I’d like to review what I have done so far on this blog; my plan, my expectation compared with the realization and final result. Earlier in this year, I set a target, which I was pretty sure achievable. I aimed to increase the rank of the blog gradually by executing some methods I believed will end as success. However, the statistics of this blog for this year shows something that is perfectly contrary to my initial plan. It can be seen in the statistical graph that the traffic trend for this blog is negative. 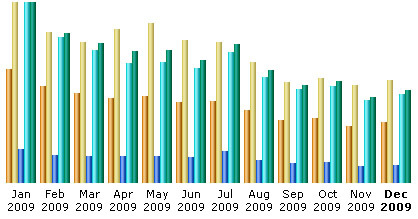 Traffic constantly decreased as the months progressed. In a bigger picture, it is clearly a sign of failure, a situation that is most unexpected by me. However, since it is there for a reason, learning and analyzing the cause and trying to improve the situation becomes interesting to me. I have learned some lessons regarding to this failure. First, time is always a constraint. Even though I read a lot about new technologies, fiddled a lot with codes, explored a lot of new stuff, created some software, and did other things which should have turned into blog posts, in reality I couldn’t do so. This exacerbated the scarcity of good quality posts. The main cause of why I couldn’t sit on my couch writing interesting stories about my experiences is because I lacked the quality time to do so. Second, inspiration to write does not come instantly. Currently I have a list of post to write. But surprisingly, even though I created the list several months ago, it hasn’t been transformed into posts. Now, I perfectly understand the meaning of “writings deserve due appreciation”. Writing quality posts is apparently not easy. Third, managing too many things will sacrifice one or two things in the list. This is related with the first two lessons. Despite being successful in my other aspects of life, I failed to do it here. Finally, perfection sometimes brings trouble to advance to the next step. In the execution my plan, I often accentuate in perfection by ensuring the riddance of any sort of flaw which often hindered me from accomplishing the whole piece. Slightly off topic, this year the economy was bouncing up again after the deceleration during the downturn. Good treatment and policy has progressively healed the wounded economy. I believe, I can also find the formula for treatment and apply it in order to go back on the track and level up this blog next year. I welcome 2010 with optimism. This entry was posted in Miscellaneous and tagged strategic plan on December 31, 2009 by Tech Admin.